This article will explain how to connect your Kapost instance with Marketo. 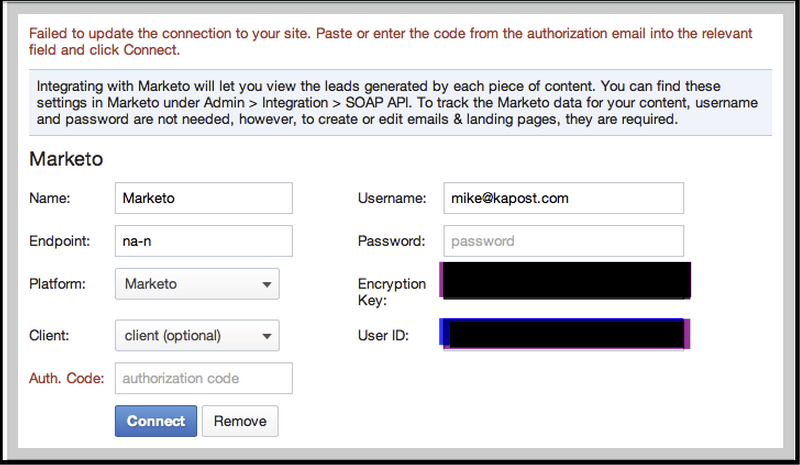 Once connected, you can easily manage Marketo landing pages and emailing from within the Kapost platform. Similar to how you connect other services to Kapost, you'll connect Marketo in the Settings area. To get there, click on "Settings" in the upper right of Kapost. If you don't see a Settings link, make sure your user role is admin. Once in Settings, click on the "App Center" tab on the left side of the page (follow the provided link for more info). Within The App Center, you'll see button labeled "Install More Apps," which will take you to a list of all the platforms that we integrate with. There will be a button available to add Marketo as a connected platform. Click that button, and choose which instance you would like to integrate with if applicable. This will open up your Marketo integration window - name the connection, and then fill out your username and password. 1. Your user needs to be a full user, not an API Only user. This will prevent any errors if your password expires. 2. 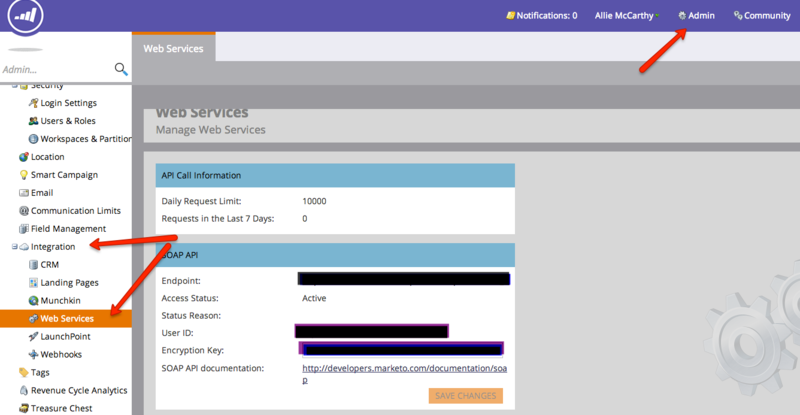 Your user MUST have access to the "Web Services" page in Marketo for your integration to work. You can find this by going into your Marketo instance and going to Admin -> Integration -> Web Services. If your user does not have access to this page, consider upgrading them to the admin level or switching to a different user. If Marketo does not recognize your device when you attempt to connect, it will ask you to perform a "2-step Authentication Process" which means that Marketo will email you an additional authorization code that you need to enter. You will attempt to connect and Kapost will display an error that you need to enter an authorization code. Click "Edit" in Kapost, which will open up the authentication area. Check your email for a Marketo email that will contain an authorization code. This email will arrive within just a few minutes of getting the error (usually immediately). Copy that code and paste it into Kapost and click "connect." This will allow you to complete the Marketo connection. Kapost cannot currently integrate with Marketo accounts that have SSO enabled within Marketo. In order to create a connection between Kapost and Marketo, a Marketo profile with non-SSO login or SSO exemption must be used to make the connection within Kapost. For more info on how to use your Marketo integration, check out this article here.